No Yahoo! employees would touch that one. “I have no idea,” one employee said. “I need to go off to a meeting now,” another answered. “You should really talk to a press spokesperson about that,” one employee said. Another deal Yahoo! missed out on was DoubleClick. The advertising network specialized in the display ads that had long been Yahoo!’s strength as it struggled to hold back a surging Google. But when Yahoo! didn’t move quick enough to purchase the ad network, Google pounced, helping to close the gap. “I don’t know, I’m not in a position to really speculate,” one employee said as he clutched a pair of boxes and a cup of juice. Perhaps Yahoo!’s biggest bonehead maneuver was failing to deal with Microsoft’s acquisition offer quickly and cleanly. As a result, the drama dragged on for months, sapping Yahoo!’s energy and opening the door to Carl Icahn, the aggressive corporate raider who grabbed three seats on Yahoo!’s board in August. The move undoubtedly led to Yang’s ouster this week. “It’s difficult to know, difficult to know,” a Yahoo employee said when asked about the matter. Other employees blamed bigger problems for Yahoo!’s woes. Some cited vague “macroeconomic” problems. Others cited competition from newer, “cooler,” Web brands such as MySpace and Google. And several argued that Yahoo! can still compete. One mentioned Yahoo!’s cloud computing initiative as an effort that could help the company claw its way forward once again. “It’s a talented group of individuals, and we’re working on some interesting technologies,” he said. “We are competitive, particularly with Yahoo! Mail and Finance,” another added. Microsoft has ruled out the bod from Yahoo but said it was intrested to have a tie up with search related products.Ballmer’s comments to a meeting of Microsoft’s shareholders were the first from the company since the announcement on Monday that Jerry Yang was stepping down as Yahoo CEO. That move was seen as raising the chances for a Microsoft buyout since Yang had been the company’s staunchest opponent of the deal that valued Yahoo at $47.5 billion – more than three times what it is now worth.The comments by the Microsoft boss sent Yahoo’s shares plunging by as much as 20 per cent after they had rallied on news of Yang’s move. “We thought we had something that made sense. But it didn’t make sense to them. We’ve moved on,” said Ballmer at Microsoft’s annual shareholders meeting. “Let me be clear. 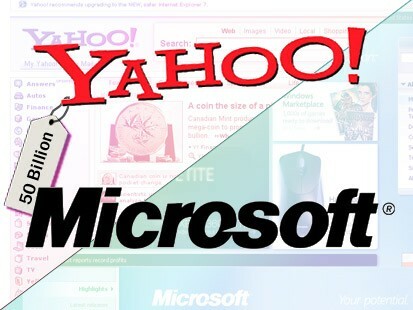 We are done with all acquisition discussions with Yahoo.”However he stressed that a partnership between Microsoft and Yahoo in the internet search market is “an interesting possibility”. Such an alliance would help the companies challenge Google, which dominates the US online advertising market that is expected to grow 25 per cent this year. Search of yahoo CEO continues as Yang decides to step down as yahoo cheif……..
Yahoo Inc said Jerry Yang will step down as chief executive as soon as the board finds a replacement, sending its shares up 4 percent on hopes his departure will clear the way for a deal with Microsoft. Yang — who will return to his former role as Chief Yahoo, focusing on strategy and technology — tried to carve an independent strategy for Yahoo and was blamed when Microsoft Corp walked away from an offer to buy the company earlier this year.Rival Google Inc abandoned a search advertising partnership amid regulatory concerns, and Yang faced a growing chorus of criticism from investors and analysts as Yahoo’s shares nosedived. Yahoo’s months-long talks with Time Warner Inc about combining with its AOL unit — as yet another way to boost Yahoo’s earnings — have also failed to produce a deal. Yang has consistently said that he would sell the company for the right price.Microsoft declined to comment.Yahoo shares rose to $11.10 in after-hours trading from their Nasdaq close of $10.63.The shares are down nearly 65 percent from their 52-week high of $30.25, reached in February, two weeks after Microsoft made its $31-a-share offer public.Microsoft withdrew its $47.5 billion buyout offer in May after Yahoo rejected the sweetened bid.Yang, a co-founder of Yahoo, took on the CEO role in June 2007, hoping to strengthen its position as an online consumer brand.”From founding this company to guiding its growth into a trusted global brand that is indispensable to millions of people, I have always sought to do what is best for our franchise,” Yang said in a statement. Last month, Yahoo announced it planned to cut at least a tenth of its workforce, or about 1,500 jobs, as corporate brand advertisers scaled back spending on Web marketing promotions amid a global economic downturn.In an e-mail sent to employees, a copy of which was seen by Reuters, Yang said his decision to step down was taken jointly with Yahoo’s board. Yahoo Chairman Roy Bostock is leading the effort to find a replacement, said Yang, who will continue to serve as a director. Pyykkonen said it was a step in the right direction for Yahoo, but warned that a lot depended on the board’s choice to replace Yang.”Because he’s stepping down doesn’t mean the company is going to magically be wonderful again,” he said.Yahoo has hired the executive search firm of Heidrick & Struggles to look for both internal and external candidates.The process could take anywhere between four weeks and 12 weeks.